Boardman summarized in a few words all the attributes of that lovely, revolutionary wooden craft called the Adirondack guideboat. Only the statement “which lasts with ordinary good care, for twenty years” might be questioned. This is the twentieth year of life for the first guideboat that I built, the Frances C. We have gone out together almost every summer day, sometimes regardless of the weather, for twenty years. How has she fared? Pretty well, I would say. Except for the time I forgot to turn her over on her rack. She filled with water during a springtime storm and fell off sustaining a nasty gash. But repairs were done and the scar is a reminder to me to be more careful of her. In honor of her twentieth birthday she gets a sprucing up. She will get a total cleaning up and a new coat of varnish. First she needs to be brought up to be under cover on our screened porch in Long Lake. The Frances C. under cover. I brought in a couple of young fellas to sand her top to bottom with 220 grit paper. After sanding the hull I go over it with tack cloth to remove any trace of dust. Then varnishing can proceed. I use Epiphanes Wood Finish Gloss marine spar varnish. It is a great product that provides wonderful protection while being easy to apply. 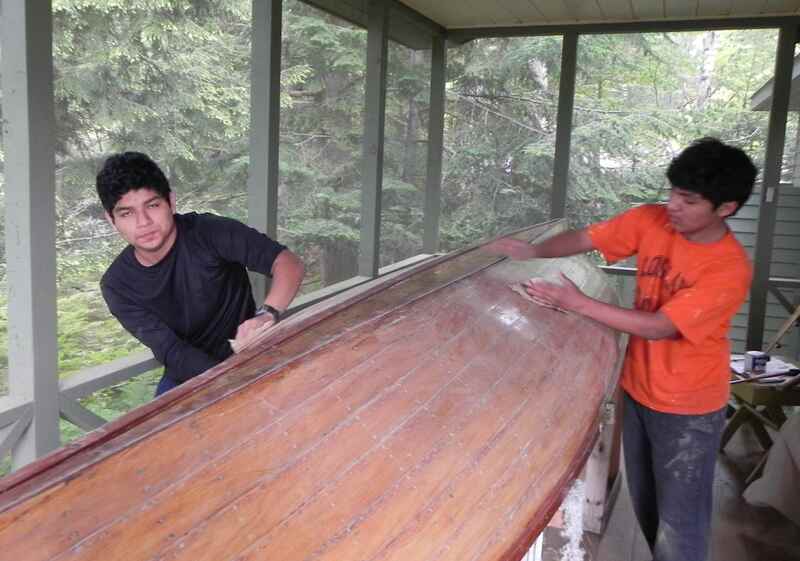 I tip the hull up to make it as horizontal as possible while I apply the varnish to reduce its tendency to run. I use a foam brush which gives a nice, uniform coat. 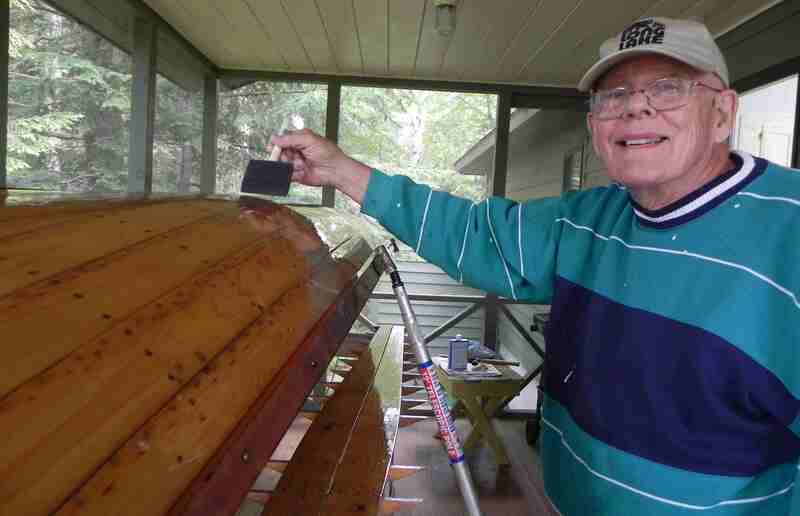 Varnishing the outside of the hull. Now, the inside of the hull. This is a bit more complicated because of the ribs. 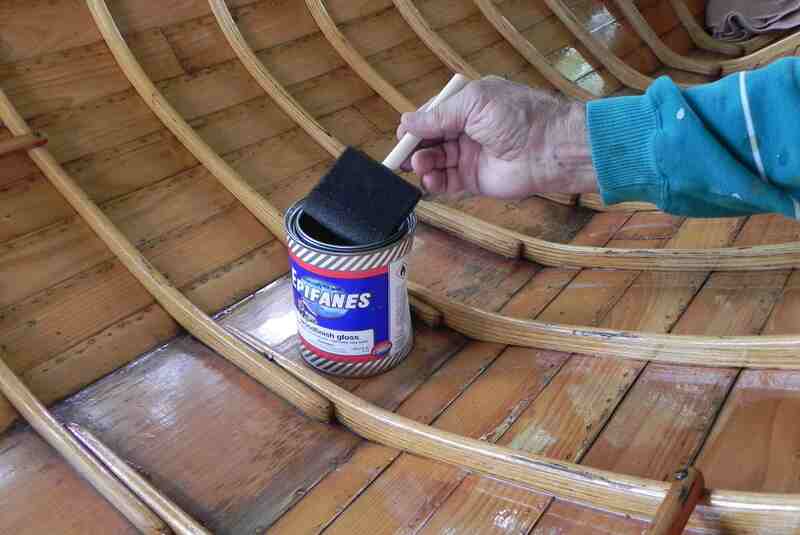 Varnishing the inside of the hull. With her new coat of varnish its back to the water with Frances. Will she last another twenty years? I’d say the prospects are good. Her planking is made of Atlantic white cedar, a wood that is almost totally rot resistant. The property of this wood was recognized by the early settlers on Eastern Shore of Maryland. They used this cedar as boundary markers knowing that it would last for decades if not hundreds of years. The downside of this wood is that it tends to split easily. Oh, well, take the good with the bad. Another thing going for the Frances C. is its laminated ribs. The combination of thin strips of ash held together with resorcinal resin makes an extremely strong, tough rib. Another treat for me was that our fifteen year granddaughter was here with us for the summer. 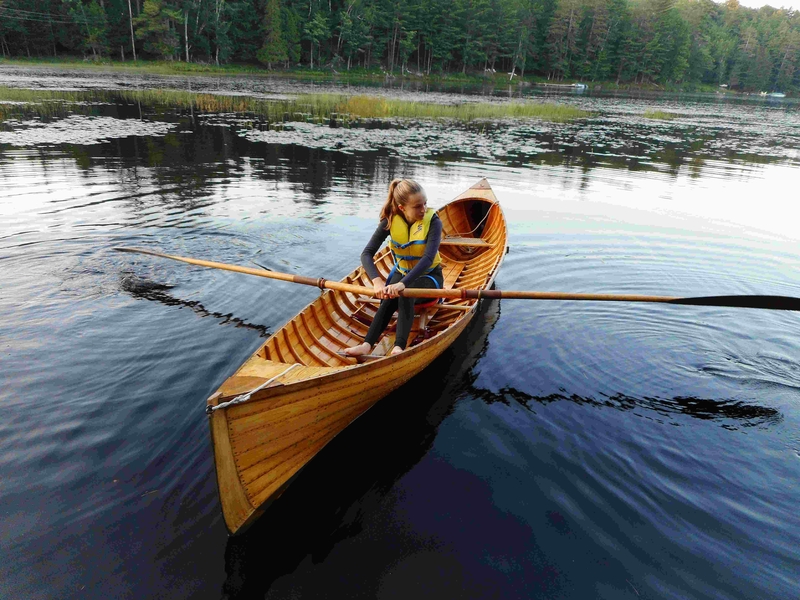 When I suggested she take Frances out for a row she exclaimed, “But I’ve never rowed a boat”. I said “So here is a chance to learn”. She did and before you know it she had the hang of it. Howdy! Someone in my Myspace group shared this site with us so I came to check it out. I’m definitely enjoying the information. I’m book-marking and will be tweeting this to my followers! Great blog and fantastic design.